Barley is a type of whole grain. It originated in Ethiopia and Southeast Asia, where it has been cultivated for more than 10,000 years. Barley was used by ancient civilizations as food for humans and animals for the longest time. In addition barley water has been used for various medicinal purposes since ancient times. This not only adds a unique delightful flavor to dishes, it also adds nutritional value to the food we eat. It is also used to make alcoholic beverages. Intake of barley is very likely to help you maintain your overall health in the long term. These whole grains are rich in protein, vitamins, minerals and amino acids essential for our health. It is a source of B vitamins, vitamin E and Folic acid. More importantly, barley is one of the richest sources of both soluble and insoluble fiber. Barley’s soluble fiber content, along with its naturally low-fat content and zero cholesterol make this grain a wise choice for heart-smart dining. Barley is also seen to be rich in tocotrienols, which is an antioxidant which helps lessen risk for contracting heart disease and cholesterol problems. Barley is available in several forms (pearled, flour and flakes), so it may be used in many different recipes and for all eating occasions – breakfast, lunch and dinner. 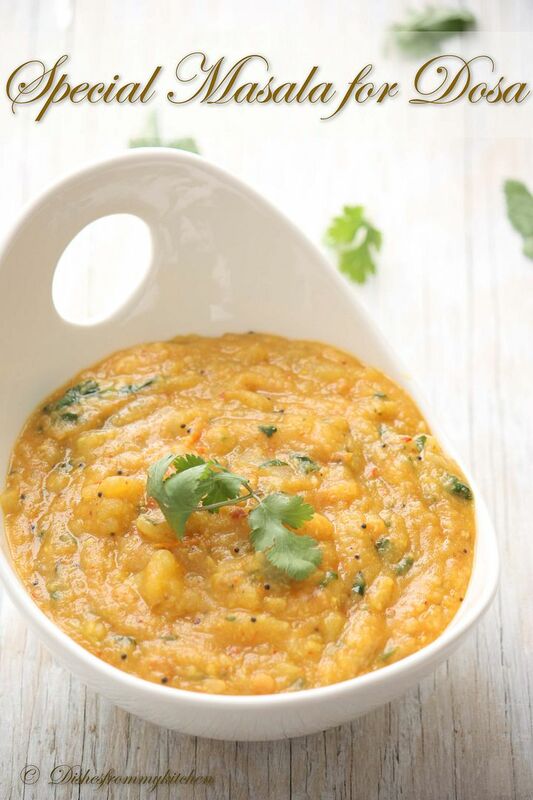 Since I use blender for grinding, the ratio I am using is 3:1 of Barley and Urad dhal... But if you are using grinder, use 4:1 of Barley and Urad dhal . 1. Wash and soak the barley for 5 to 6 hrs. 2. Wash and soak the Urad dhal + methi seeds for an hour. 3. Grind the urad dhal finely and foamy. 4. Grind the Barley to fine batter. 5. Mix both the batter (consistency should be normal dosa batter) by adding salt and ferment it overnight. 6. Pour ladle full of batter in the middle of hot skillet the go towards the edges of the skillet. 7. Put tsp of oil when it gets slightly brown at the bottom flip over the other side. 8. Add tsp of oil and make crisp. 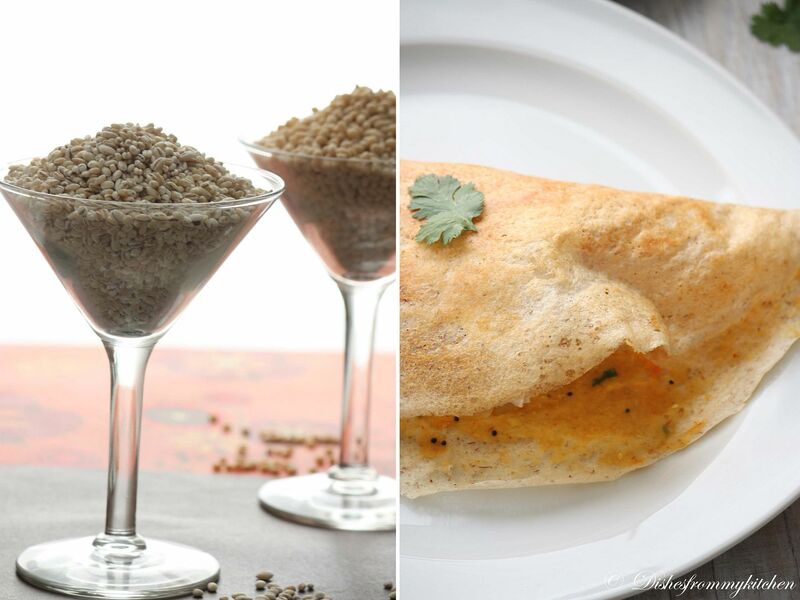 You can serve this Barley Dosa with your favorite chutney or sambar. Gingelly oil (Nallennai) - 3 to 4tbsp this is a must , gives wonderful flavor to chutney. 1. First dry powder the red chillies. Add garlic, tamarind and salt grind to fine paste. 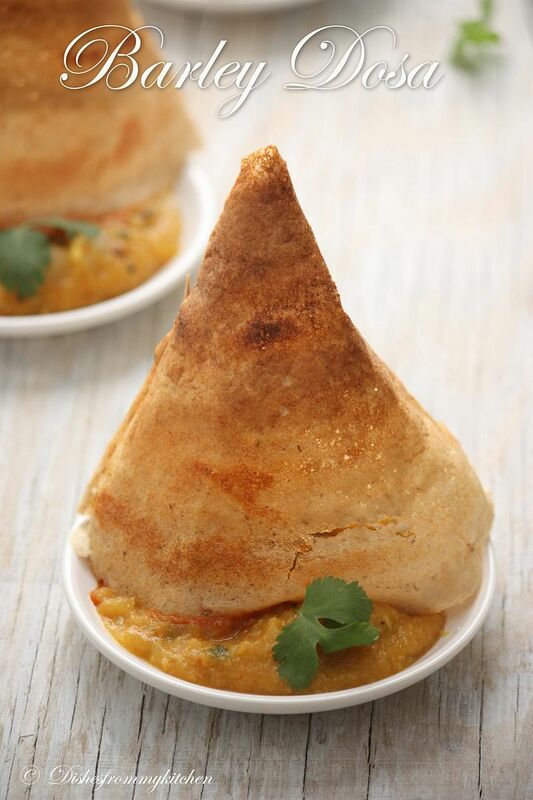 Here is an idea for Barley Masala Dosa. 1. Boil the potato, cool, and mash it. 3. Heat oil in the pan, add mustard once it splutters add urad dhal, onion and curry leaves. 4. When it is slightly brown in color add the tomato, when it is mushy add the ground paste. 5. Boiled and mashed potato, add 2 cups of water and now add salt. 6. When it comes to nice boil and thickens, add the lemon juice. 7. Mix well and garnish with lot of coriander leaves. 8. Let the masala cools down, it thickens when it cools down. 9. Now Pour ladle full of batter in the middle of hot skillet the go towards the edges of the skillet. 10. Put tsp of oil when it gets slightly brown at the bottom flip over the other side. 11. Apply the garlic chutney on one side and Masala on other half. Fold the dosa press it softly apply 1/4 tsp of ghee serve hot. Same Dosa batter can also be used for making Idlies. Looks very crispy and yummy, amazing photographs. Everyday I get more excited about your spices and ingredients. Fantastic! Crispy and yummy dosa, delicious breakfast. This barley is something I have heard of but not used. I believe it is called Javas in Marathi, Jau in hindi. I need to hunt it out. Must try these recipes ! Thanks for sharing! woww amazing clicks...love this crispy n healthy dosa!! Wow nice detailed presentation & clicks !!! Nutritious and delicious !! What a brilliant post with such enticing visual treat!! 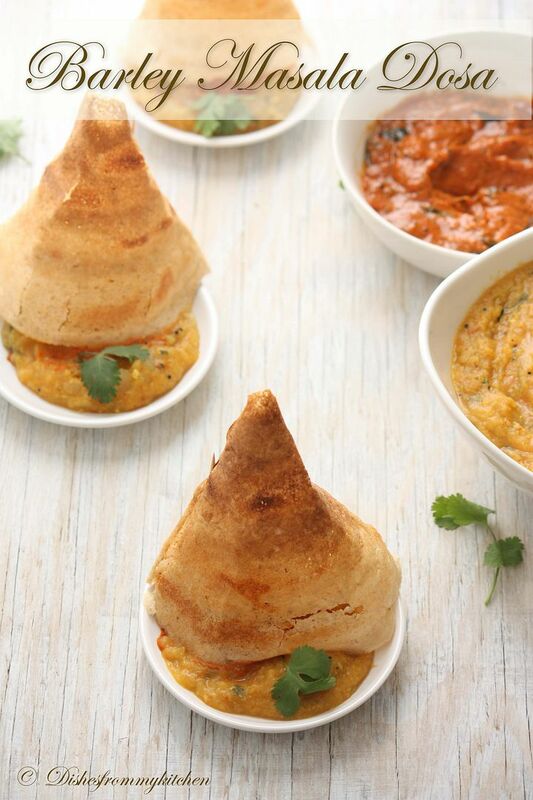 That is defanitely a unique idea, love the little dosa hats ! As ususal,fantastic photos. You're really making me drool so badly. It looks very tempting and amazing clicks..
Clicks r wonderful asusual and dosa is crispy and yummy. My all time favorite. and one more thing even I have posted a healthy dosa today....so SAME PINCH!!!! he he he..
Looks so delicious and love the pics ...barley using is great idea...I never made masala in this consistency ..will try it ..
That's a true visual treat, amazing post. This sounds amazingly good and healthy! 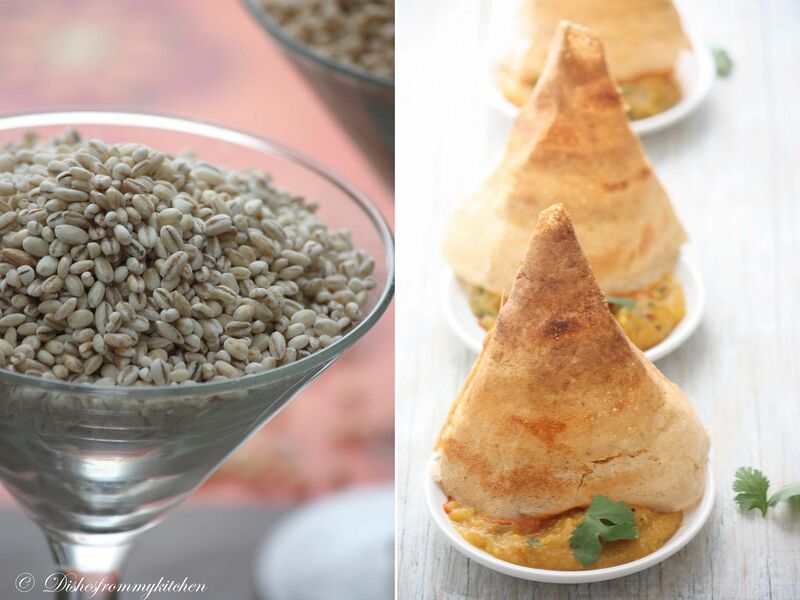 I never knew you could make dosa with barley. Did u use the pearl barley? I need to give this one a try some time. 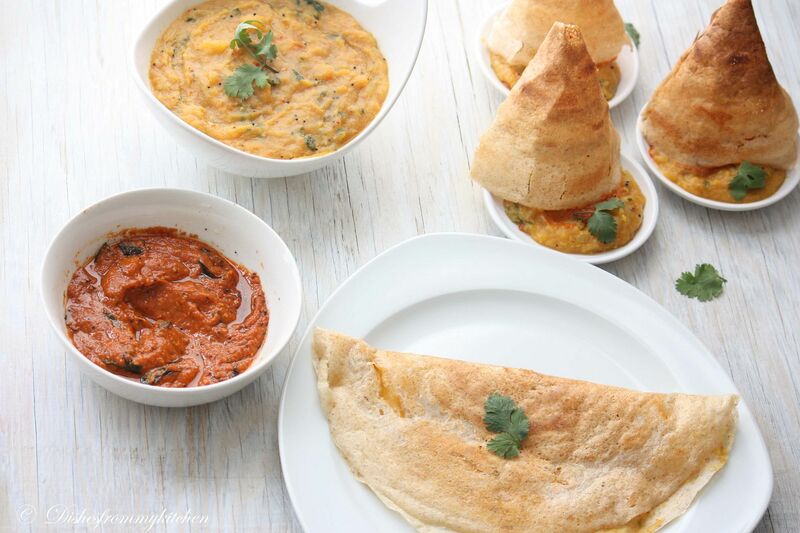 Amazing.. love those cute hat healthy dosas..
wow wonderful post!...bookmarking it!...love all ur clicks!...the masala is just to tempting!...such a healthy dosa too! 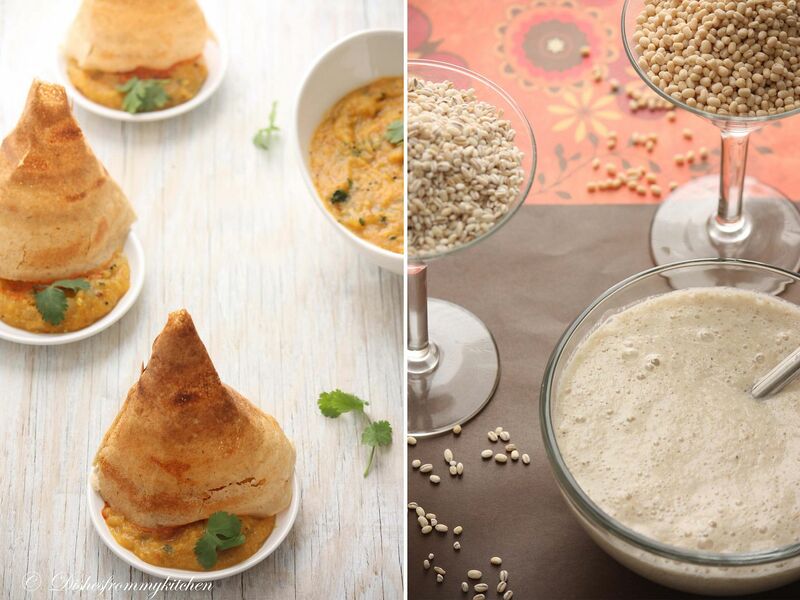 Wonderful clicks..So tempting & healthy dosa. Thank you for posting the recipes and process photos! I'm trying to learn some new Indian dishes! Looks healthy and delicious..lovely spread. Pavi - love the barley dosa. New to me - I don't use barley this way. Will do now. And this consistency of masala is how I make it too - love this type of masala with puris! Seriously u r killing me with ur clicks Pavi, am an addict to barley dishes, dosa looks absolutely prefect for me,thanks for sharing..
Dosas are really tempting.. Lovely pics..
Pavithra this is really awesome,too gud recipes. wonderful post and lovely dosai. Awesome recipes n pics !! Oh looks so inviting and tempting Pavithra :) definitely in my to-make list.. I've never cooked barley. But dosa is my most fav.. looks yummy! with the nice delicious masala..
Lovely presentation, Pavithra! 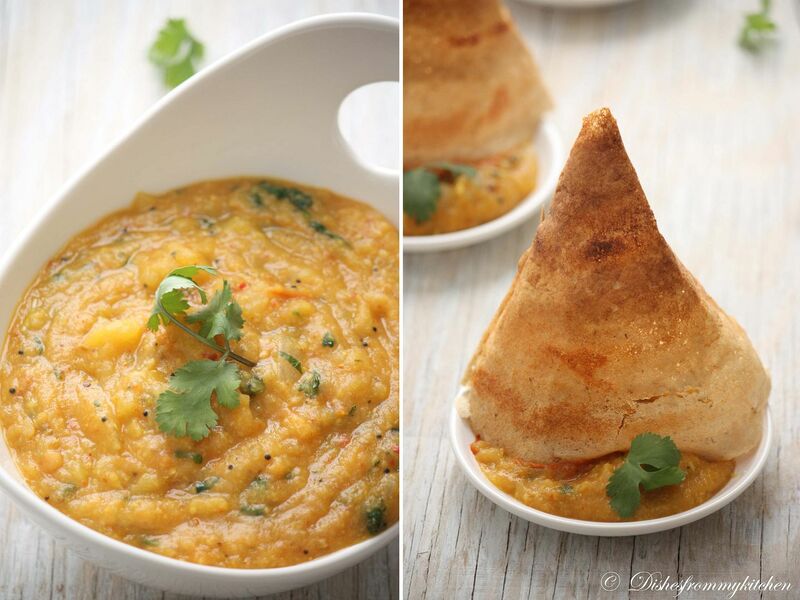 Love the healthy version of dosa. I never thought barley dosa, very beautiful pict. I almost make the chutney and masala the same way! love the idea of using Barley in dosa... Will try it out this week :) Masala or no masala, I love a good dosa any time of the day. And I have to say, that I love your photos. They are always crystal clear and colourful. healthy and interesting dosa....beautiful pic n click! dosas with barley never thought of that. came out so wonderful.very nice presentation. even my mom allso makes the garlic chutney in the same way,except some small variation.And i have scheduled that for my next post. Delicious and yum Indian Snacks. looks amazing. Bookmarked it. What beautiful pics. Your pics are always amazing. I am surely going to try it out. As, I too use grinder, I will use 3:1 ratio. Can you tell me on an average with your measurements, how many dosa I can make? Just some ballpark number. Pavithra it is not even dinner time and I am feeling hungry... delicious one perfect with those masalas and chutney. As usual a fabulous post by you! Innovative recipe and gorgeous photos! wow wonderful post... yummy and visual treat.. Nice step by step pictures..
cant take my eyes off..So lovely..
Those pancakes are so special! Never had barley pancakes...wish I could try a few of them now. This is out of the world. What an Amazing way to eat Barley and have a guilt free dish. The Presentation and dish looks outstanding. You rock as always. I tried this recipe last weekend and the dosas came out perfect. Thanks for introducing barley to our diet!! Thanks bharathi.. thanks for trying this and letting me know. Glad you enjoyed. Sure this is great way to include Barley in our diet. This is real treat to eyes and stomach.. Superb..
“Dishesfrommykitchen” left us in awe by its presentation of vegetarian. 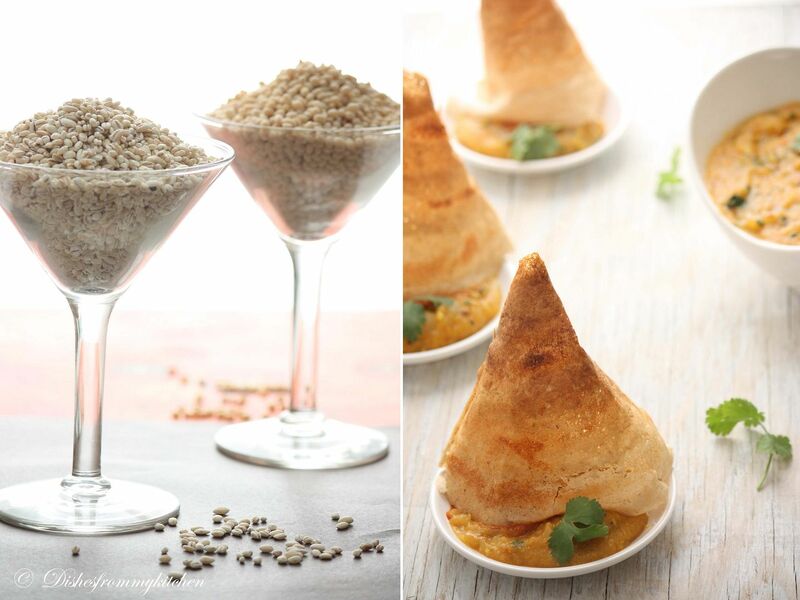 Not to mention “Barley Masala Dosa”.We would love to feature your culinary skills on our global platform.